This delicious maple beet and spinach salad was inspired by a recent trip to Lake Louise, Alberta, Canada and quickly became my absolute favorite dish to order. 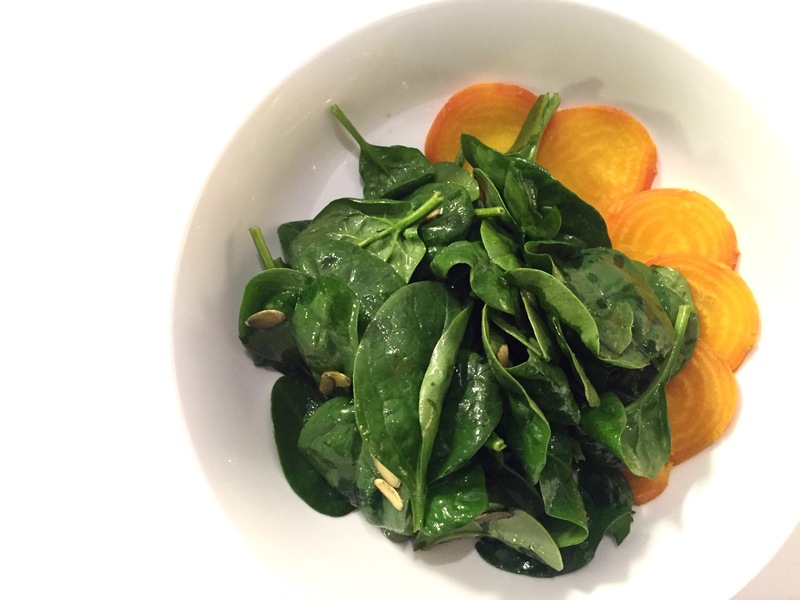 This salad is loaded with nutrients due to the spinach and beets (I mean look at them- look at that color! ), in addition to the hint of maple I put into the dressing (maple syrup is also chalk-full nutrients – believe it or not!). Try having this salad on it’s own as an appetizer or to make it more of a meal you can add your favorite lean and clean protein like grassfed beef, organic chicken or wild fish. If you looked in my lunch box, you’d certainly find this salad showing up pretty much every day just because it’s so tasty and delicious. Wash and prepare salad ingredients and put into a large salad bowl (except beets, sliced thin)- leave those aside. In a small dish whisk together the dressing with the maple syrup and pour over salad. Using salad tongs or wooden spoons mix dressing thoroughly through the salad. Lay 5-6 sliced beets on each plate, and then add salad on-top of the beets for an easy and beautiful salad. Optional to add lean protein (chicken or fish) for a more complete meal- or even some avocado as garnish.